Somehow April is already in the books and now it's time again for my favorite monthly update, my dividend update. These dividend updates reflect all dividends that I receive through my investing pursuits and I hope can help inspire you to take control of your own finances and to invest to build a passive income stream. What you use that stream for is up to you, whether it's to fund early retirement, just provide some FI/FU money, or even to provide for an annual vacation; the key is that it can provide options and opens up all sorts of possibilities. April treated me quite well on the dividend front and finally cross $200 in one month for the January, April, July, October payout schedule. Dividend growth investing is hardly a get rich quick strategy as it takes time, consistency, and dedication to build up your portfolio and its' dividend stream. You can check my dividend income or progress page to see what dedication to an investment plan can give you. The beauty of investing in dividend growth stocks is that you don't have to spend 40 hours a week earning that money. The companies do the work for you and cut you a check. May will probably be the last month that I have automatically reinvested dividends since I decided to try collecting them in cash and reinvesting them with new capital. Time will tell if I keep it that way. I received a total of $203.98 in dividends in my FI portfolio in April and have received a total of $1,143.30 so far in just 4 months. It took me over half of 2013 to pass $1,000 so it's been amazing to see the dividend stream continue to grow. I also received $23.85 in dividends in my Roth IRA which brings my total for 2014 to $66.51. April's total for my FI Portfolio was a 36.6% increase from January 2014 and a whopping 201.3% increase from April 2014. A lot of the increase from January was due to Coca-Cola not paying in January but making their first payment in April. 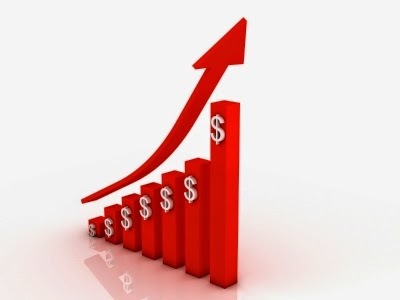 Now matter how it comes an increase is an increase and still represents growth. I'm now 25.41% of the way towards my goal of receiving $4,500 in dividends this year and we're now 1/3 of the way through the year so I've got some work to do in order to meet my goal. I made three purchases this month with two adding to existing positions and even starting a new one. I added to my position in Johnson & Johnson which seems like that's always a good idea. I also added to my position in American Realty Capital Properties but have yet to get a post up covering all of the juicy details. The purchase I'm most excited about is my new position in Starbucks. I don't necessarily think it's cheap here but it appears to be a Peter Lynch GARP stock, growth at a reasonable price. I think Starbucks still has a long road of growth ahead of them and in turn that should lead to higher dividend payments to me as a part owner. Besides making new purchases I also had some of my favorite things for my portfolio: dividend increase announcements. Make sure to follow me on Twitter for quicker, almost instantaneous updates about new purchases. In total 5 of my holdings announced increases this month, although I was expecting 2 more to announce this month based on last years announcements. But Exxon and Chevron are announcing earnings and most likely dividend increases today and tomorrow, respectively, so what's a few days really. It's the payment that really counts. Thanks to the increases and purchases, my FI Portfolio's forward 12-month dividends are up to $4,270.02 and my Roth IRA forward dividends are at $225.03. My FI Portfolio's dividends are now 85.40% of the way towards my goal of $5,000 by the end of 2014. I've added a new chart showing the yearly monthly dividend totals to show how the dividends received from my portfolio continue to increase. It's not always an increase as some companies have weird payout schedules and eventually you'll be forced to sell a position or two, but the long term trend is what matters. I'm currently averaging $313.11 in monthly dividends this year compared to $212.23 per month in 2013. I've updated my Dividend Income and Progress pages to reflect April's changes. How did your dividends do in April? Set any personal bests? Nice looking month. Your year over year growth is aggressive, I like it. I forgot about the CVX increase due. I'm guessing/hoping they go 10% or $.40. History suggests that amount. We'll see what MGT thinks. CVX, 7%. I missed that yesterday. Not terrible. Maybe a little disappointing. Yeah I missed the announcements from CVX and XOM yesterday although it looks like they came in at 6 pm yesterday which is rather late. With all of the capex last year and at the start of this year I was expecting something like 5-7% from CVX so them being on the high end of that range was fine by me. As RBD says, its quite impressive to see the year on year growth. A great source of inspiration for myself! I was a bit surprised myself to the see the YoY and even QoQ growth. I hope that by being very transparent with my investing that it will help inspire/motivate others. You're off to a great start on your own journey. Congrats on crossing the $200/month line. At the rate you're contributing I think you'll hit your $4500 in 2014. Keep up the good work! It's pretty cool to know that I'll be over $200 per month from here on out, barring any dividend cuts. I'm still not sure if I'll hit it or not because while I'm saving a lot, I haven't been able to put a whole lot of capital to work because the markets seem a bit high. Finding some good value opportunities has been difficult. Hopefully we get some "sell in May and go away" action this year. Congrats on the dividend income, JC. You are making great progress YoY. Keep it up! If I can ever start investing heavily again then it'll be even better. I was surprised to see a 200% increase YoY, although it was still off a small base last April. But progress is progress. You had a solid month! That's an impressive yoy increase. I see you are selectively dripping some shares. I do that from time to time and I have KO on auto-drip since they are about as close to a forever company as you can get. I was happy about the 7% increase from CVX late yesterday. Royal Dutch Shell also just increased their dividend the day before. Although larger than the previous increase, it still just came in around 4%. The oil companies gave a lot of increases the last few days and BP even joined in with an unexpected increase. No complaints here. I think auto reinvesting core positions, if you want to call them that, is a great way to DRIP. I do find Scottrade's FRIP program to be quite nice, but it's not perfect. It has to be turned on the day prior meaning you won't exactly know the trigger price (2PM EST). Still, it's free and a step up from DRIP in my opnion. DRIP, FRIP, selective reinvest. I honestly don't think it matters that much... The whole point is to acquire more shares! Selective reinvest is my personal favorite, yet I take advantage of each for certain circumstances. The FRIP allows for a lot more flexibility since you can choose which company to reinvest in for free. I agree that the important part is to reinvest, no matter how it's done. With auto reinvest you get it done as quick as possible and get the company working for you but you might not get good value on that capital but with selective reinvestment you get to get better value but it might take a while until you can get that capital invested. Decisions decisions. Although I think I'll probably be turning it back on for my core forever stocks. Just thought of this with the FRIP. I think you can select 5 companies to reinvest dividends in but is that with all dividends received in the portfolio or just from the 5 companies you have at the time? Depending on how it's structured and if you wanted to pay close attention to ex-div dates you could constantly change your companies and keep reinvesting dividends right before the ex-divs to get a little bit faster compounding. It'd require a lot more work to also keep up with all of the ex-div dates and payout dates but you could churn the dividends a bit faster. Excellent month! Congrats on all the purchases and raises. I'm excited to see how you'll selectively reinvest after May. I hope for some good values so you can put some more money to work. Enjoying seeing on on SA so often, keep up the great work!!! I wish I was with Scottrade and could utilize the FRIP because that would give more flexibility and I could reinvest the dividends quicker. Now it's going to be more reliant on how the markets are doing at the time for how quick the money gets put to work. Glad you're liking SA. I think it's helped to grow my blog a bit more too which is always nice. I had about $60 over the last two months so I'm getting excited! Tracking is awesome! Just a matter of keeping up the good fight and not giving in to buying frivolous crap! That's great! I love tracking mine and seeing the progress month after month. Some months see more gains than others but it's consistently moving in the right direction. Another great month. And like many others commented, the YOY growth is fantastic. Keep it up, my friend! You still looking at rental properties? I was surprised to see 200% YoY growth because it didn't seem like it was. I'm still looking at rentals off and on. I should be heading back home this Sat/Sun and I'll be off for about 1.5 weeks so the plan is to talk with some turnkey companies that operate in Houston and make my decision then as to which route we'll go. Rental or no rental. I think rentals have great potential and with the low mortgage rates now is the time to try and get some properties. Well a few years ago was the best time but now is still pretty good. I should have some more clarity over the next week or so. I'm averaging just under $300/mo in dividends this year. It finally feels like the snowball is starting to get rolling a little bit. I'd love to see the dividend growth over the next year that youve had. That's awesome. I'm at pretty much the same level so far this year and it definitely feels like it's starting to pick up steam. Seeing that cash hit my account month after month sure is a great feeling. Awesome job! Looks like you are chugging right along. My dividends in April are 25% higher than last year, so I am making solid progress! A 25% increase is great and it'll just continue to get better and better. Eventually we'll all get to a point where our monthly dividends are more than we can invest each month from savings and that's a huge milestone. Keep up the good work! Great job dude. Big improvement from April of last year :) Not surprising considering all the dividend growth stocks you're holding :D I think Starbucks will continue to grow their eps too. I'm a big believer in people's ability to drink coffee so I have both SBUX and THI. That's interesting. You are faced with a 15% with holding tax on Canadian dividends, where as I'm met with a 15% with holding tax on dividends paid by U.S. companies lol. Unless of course the security is held in a tax sheltered account like the RRSP. I'm really excited about my ownership in SBUX. I know all of the SBUX locations I drive by are always packed. Lots of room for growth with their core business alone and the tea, mobile payments and wine/alcohol could spur on even more. I'm contemplating selling BNS because of the taxes, although I guess it's not that bad because that's what the US dividend tax rate is. It's just a matter of whether the taxes are withheld when the dividend is paid or when I do my taxes each year. I can't contribute to a tax sheltered account due to income, good problem to have I know, so I can't get those dividends protected. Well done...Our family also recently decided to stop our DRIP and instead receive our dividends in cash. With the current market performance, we simply prefer to have more control over which company to reinvest our money into. Secondly, we also found that when it comes time to sell and/or prepare taxes on the sale, it was a bit more complicated when you DRIP. And since we currently receive 100 free trades a year with our trading account, we no longer saw the benefit to DRIP. There's definitely pros and cons to both. But ultimately I'm in the same boat. I want to have more control over when/where they get reinvested. I hear you on the tax issues. I had sold some shares that had 6-8 dividend payments and that was a pain. Even though TurboTax imported all of the transactions correctly I still had to go and double check them all. That was a pain. 100 free trades? What broker and how'd you get that? Nice job on that dividend income! Over $200 is impressive for a slower month like April. Keep up the great work!